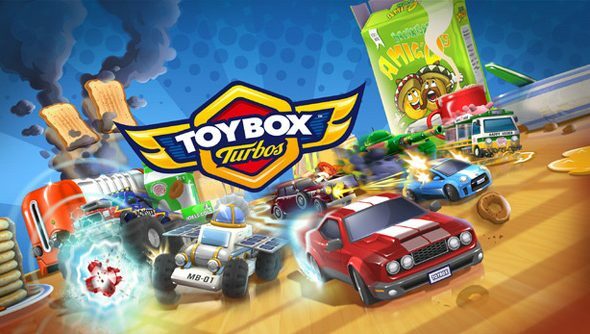 You’ve never seen Toybox Turbos before, but it’s going to start looking intensely familiar from the moment you push play on its trailer. The inspiration for Codemasters’ miniature isometric racer in a household setting is clear to anybody who ever peered over the shoulder of a friend playing Micro Machines in the playground. Those floaty physics looks like just the thing for post-ramp, mid-air jostling. The ‘90s-riffing retro game will come to Steam at a sensible price point of £11.99. It’ll constitute 18 circuits set in a variety of locations that’ll ring a bell with the under-10s – kitchen tables, school desks and railway sets. Where Toybox might draw you in is with its four-player local and online multiplayer, which sounds ideal for hastily-arranged Steam gatherings. Expect 35 vehicle types, including sports cars, dragsters, taxis, ice cream vans, milk floats and moon buggies. Power-ups and environmental hazards will liven up the whole affair. It was a surprise to me that the Micro Machines series actually originated with Codemasters in 1991. Are you happy to find them looking back, or would you rather they concentrate their energies on claiming a few more places in our list of the best racing games on PC?